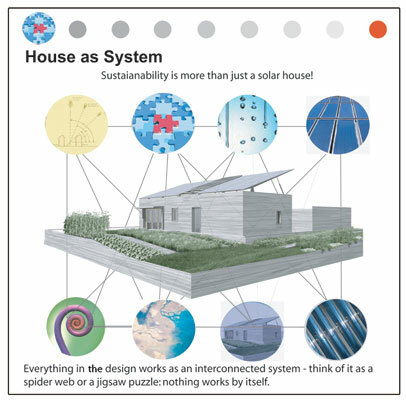 Interpretive Signage 1: House as System: This illustration served as an introductory piece of interpretive signage and represents the complex web of connections that the house and landscape create when thought of as a functionally self-sustaining system. Icons of the web directed visitor's attention both to other interpretive signage used within the project as well as major elements of the system. 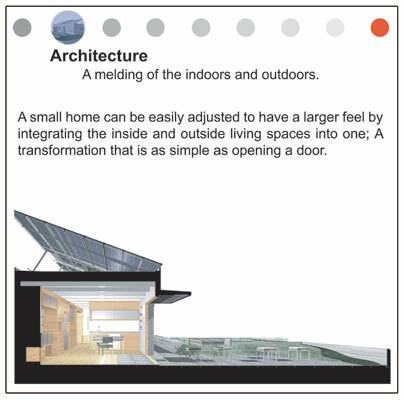 Interpretive Signage 2: Indoor/Outdoor Connection: This computer generated image from Form Z illustrates the concept of indoor/outdoor connection that was instrumental in designing the house and landscape. It was this connection that the architects and engineers gave as the sole responsibility to the landscape architects. Interpretive Signage 3: Keyhole Planting Design: This illustration also served as a part of the interpretive signage display and represents a principle of permaculture known as the keyhole design, a system that through research was found to be more sustainable than the traditional methods of row-planting edibles. This design concept organizes plants around a small open space at its center with plants placed in concentric circles of increasing diameter: short plants that are accessed most often are placed closest to center; medium sized plants that are accessed less frequently are placed in the next circle; the outermost circle contains the tallest plants that have the shortest harvest period. Illustrative Planting Plan: This document was one of three construction drawings for the planting design. This detail represents the conceptual aspects of the keyhole design. 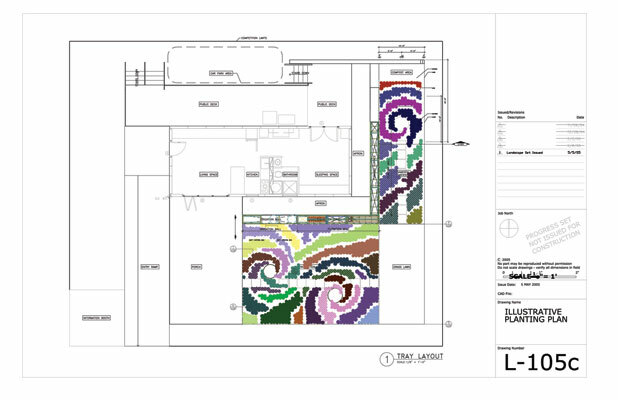 These construction documents were reviewed and submitted as part of the design process. 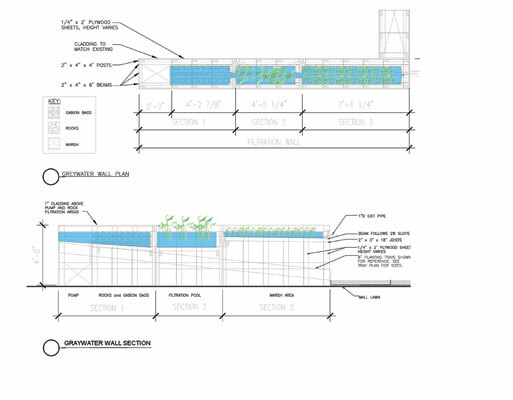 Gray Water Filtration Wall: This illustration was adopted from the construction drawings and served to illustrate the concepts behind the gray water filtration system which functioned as a miniature wetland to filter gray water from the sink, shower, dishwasher and washing machine. Water was filtered through this gray water wall to irrigate the 240 square foot tall fescue lawn. 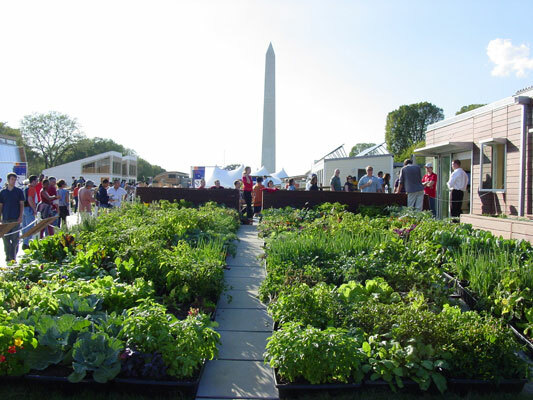 This photograph depicts the house and functional landscape comprised of 1500 edible plants, gray water filtration wall as installed and displayed on the National Mall. "Finally! A model solar house that incorporates the landscape. The details are amazingly well thought out and the planting plan is very lush. The level of collaboration among several disciplines is clearly very high. " Project scope and size: 1400 Square Feet residential landscape for an 800 square foot comprised of 1500 edible plants and 240 square feet of tall fescue lawn. Site and context investigation: The landscape design revolved around working with architects and engineers to literally and figuratively connect a stand-alone and self-sufficient solar house removed from the electric grid. Design program: The program for the landscape was multifaceted. 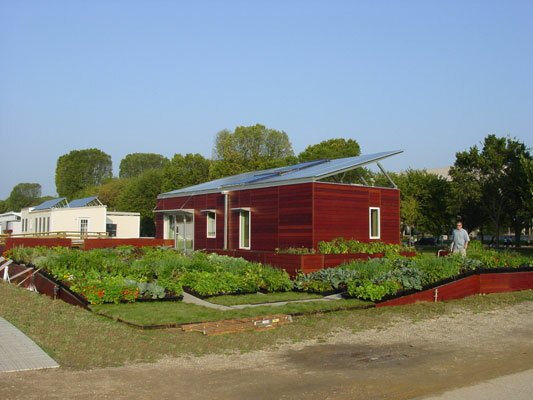 As previously mentioned, the primary objective was to work with architects and engineers to design and install a residential garden to accompany a stand-alone and self-sufficient solar house completely detached from the electric grid. 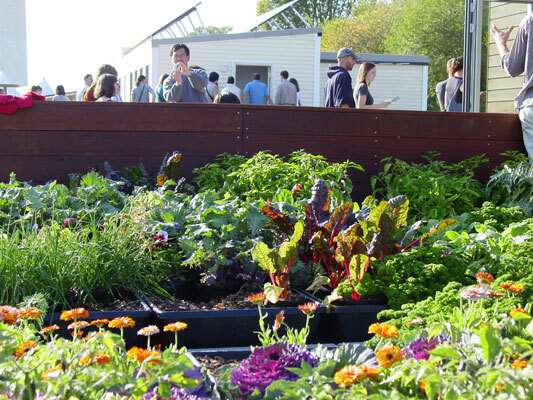 At the simplest level, the design and display aimed to illustrate concepts of permaculture, creating an entirely edible garden that could be ornamental and aesthetic in both form and function. Beyond this, the project demonstrated that sustainability could be achieved through this cohesive indoor/outdoor connection of house and landscape. As such, the design conveyed both literal and figurative connections: the indoors was expanded by the outdoors so that food cooked in the kitchen was produced in the garden; dirty water used in the shower was filtered through a gray water filtration wall and used to irrigate the lawn; runoff collected from the roof was stored for use in the garden; scraps from the kitchen were composted and returned to the garden to provide nutrients and nourishment for the vegetables. Design intent: The larger objective of the landscape was to close the loops of production and consumption. 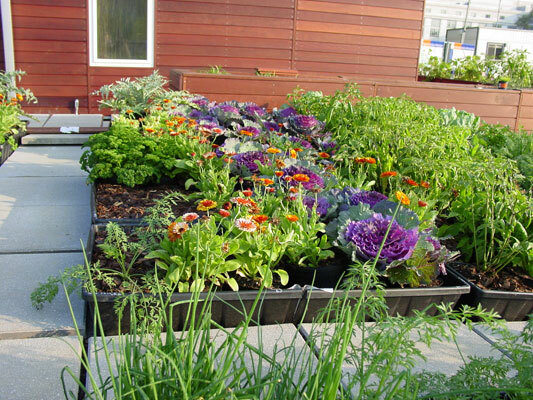 In this way, the house and garden worked together as a single entity to create an independent and self-sustaining system. Through this unique exhibit we aimed to promote a paradigm shift in the way the traditional American landscape was perceived; that the ideal of the contemporary landscape moves away from the traditional notions of the lawn and ornament and towards a more functional aesthetic. This includes thinking about the landscape as a market basket, a filtration system, a collection system, a wildlife habitat and finally as a means of capitol production. Over the last century our world economies have evolved from the local to the global. Our landscape attempts to change this paradigm from the global back to the local. In this way, the landscape becomes more than just an aesthetic entity, but one that is productive and beneficial for not just the resident, but the larger community. 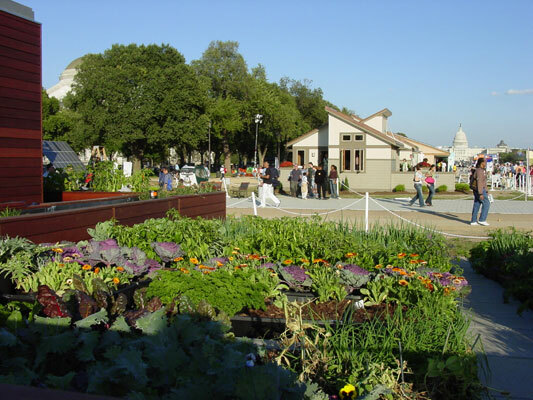 Environmental impact and concerns: Due to the sustainable nature of the house, the landscape minimized environmental impacts through producing food and compost. Additionally, gray water from the sink, shower, dishwasher and washer and drier were filtered through a gray water filtration wall which mimicked a natural wetland. Lastly, Rainwater was collected and stored for irrigating the garden in order to minimize runoff from the site. Design challenges/significant issues addressed: Coordination with the architecture and engineering team posed a significant challenge. Additionally, growing each edible plant from seed for installation was a learning process for landscape architecture students trained to work mainly with woody and ornamental plants, while research into the principles of permaculture required a paradigm shift in the thinking of all students involved in the project. Lastly, the challenge of taking a project from conception to installation during the academic year posed a serious challenge to the classload and requirements of the MLA degree. This photograph illustrates the ornamental qualities and aesthetic design of the functional landscape. 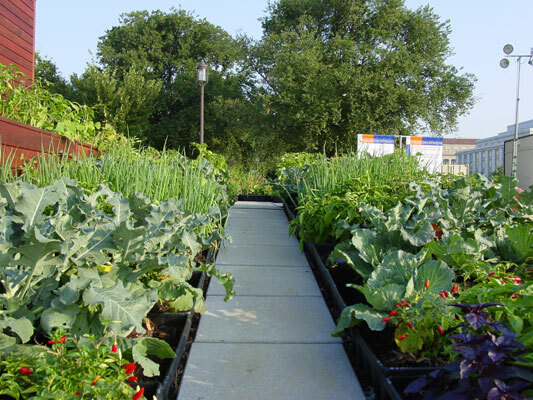 Plants were chosen for their functional qualities, but placed according to texture, color and size. This photograph also highlights the ornamental qualities of the functional landscape. Onions, Carrots, Kale, Colengela, peppers, Beans and Artichokes create a rich tapestry of texture and color. 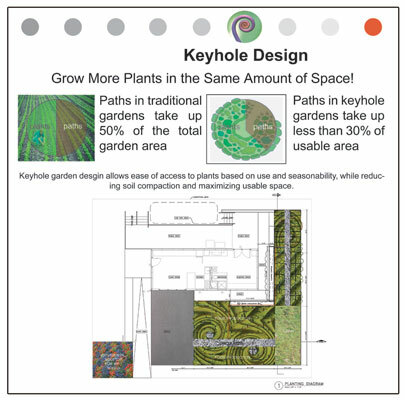 Paths through the garden ensure easy accessibility to the plants within the keyhole arrangement. This photograph shows not only the ornamental qualities of the functional landscape, but also how visitors responded to the display. Photographs and questions were numerous, and even though access to the garden was discouraged due to liability reasons, visitors could not help but walk through the garden to see the plants up close. This photograph depicts the western view of the site context on the National Mall as well as the texture, patterns and drifts used to ornamentally arrange the functional landscape. This photograph depicts the eastern view of the site context on the National Mall as well as the way that visitors viewed the garden. Due to exposure on two sides, the garden had to be planned and designed to accommodate and take advantage of this exposure.